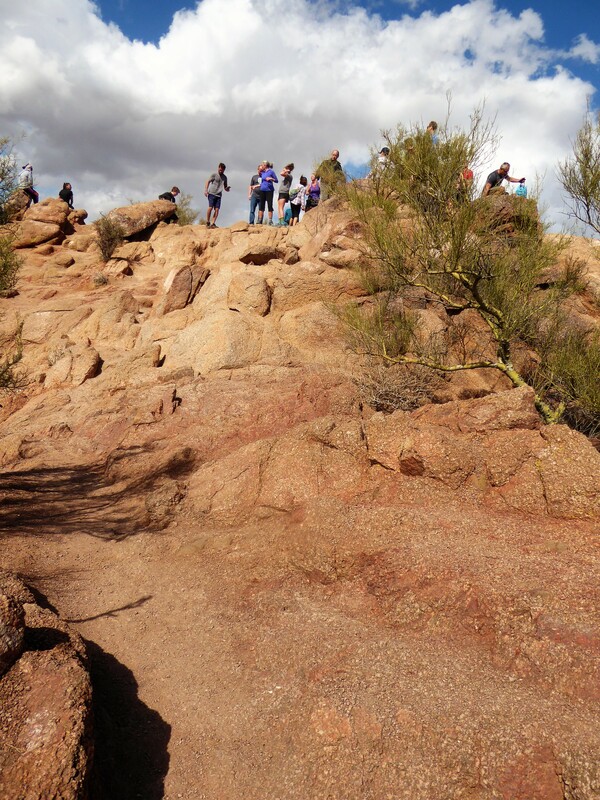 The helipad along the Cholla Trail on Camelback Mountain has been a landing spot used numerous times by rescue teams to help injured or lost hikers. 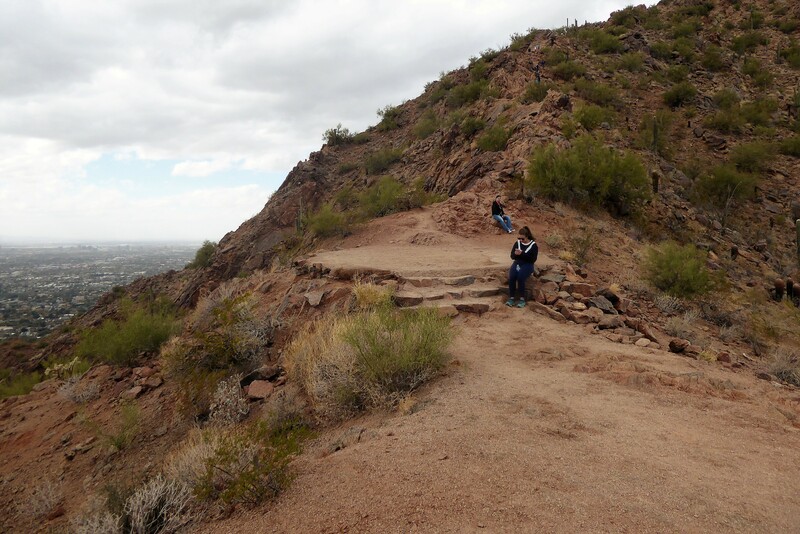 Seeing as how Camelback Mountain is the highest summit in the Phoenix area this hiking trail is extremely popular amongst local hikers … as well as unfortunately with visitors who may not be fully prepared to hike it. 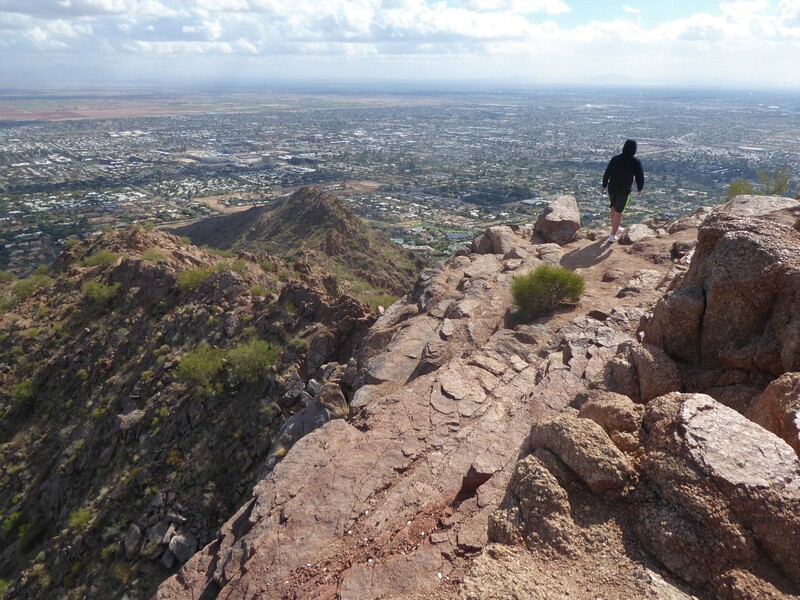 Along Camelback Mountain there are two hiking trails leading up the summit, Echo Canyon and Cholla Trail. 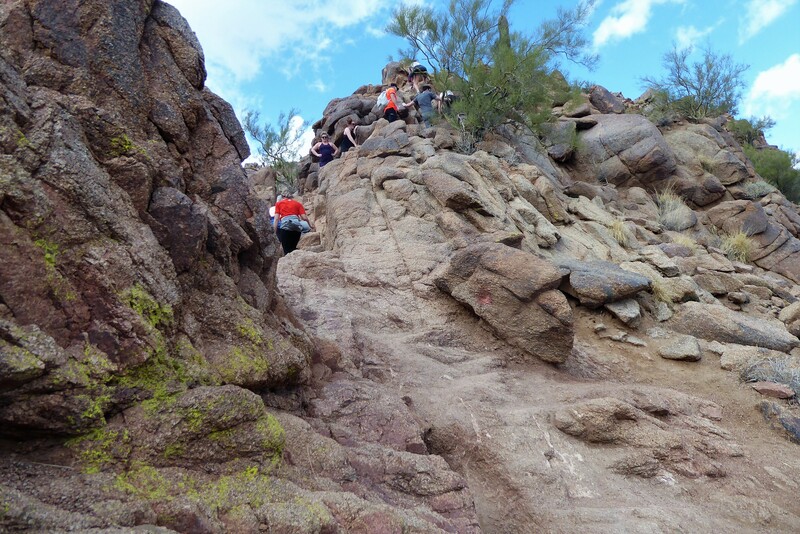 Cholla Trail is actually the easier of the two, but that doesn’t necessary mean that this is an easy trail. 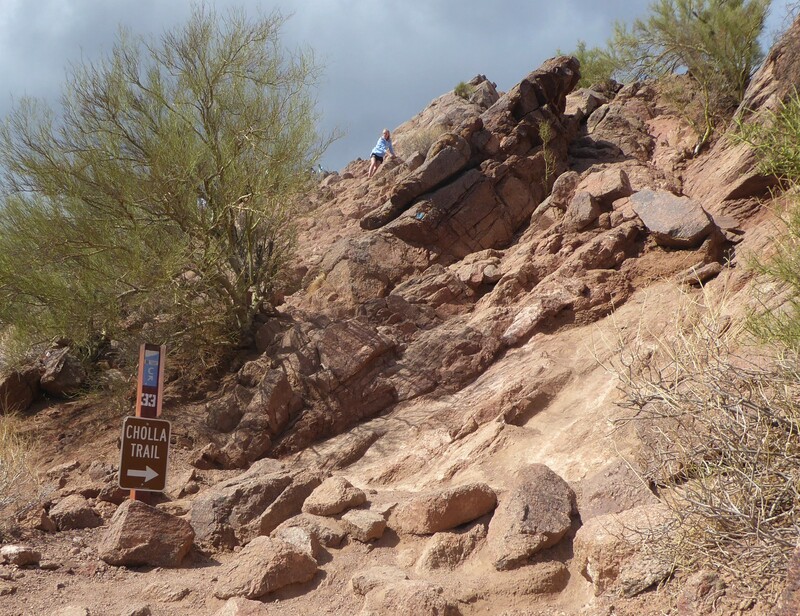 In fact, just getting to the trailhead can be a challenge within itself! Therefore, before I talk about the actual hike, I think it’s best to give you some tips about the trailhead. 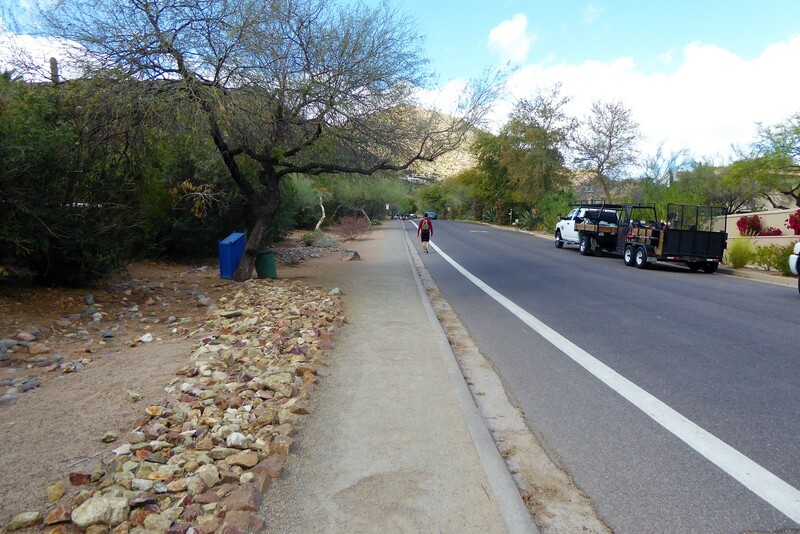 It’s located on the West side of the Mountain along an upscale neighborhood street in which there is no parking or trail pickup and drop offs allowed. So this means your only parking options will be along a main street where you will need to parallel park or get dropped off on. From the main road and then you will have to walk towards the trailhead. This is a very popular hiking trail, so be prepared for limited spaces available during peak hiking time. 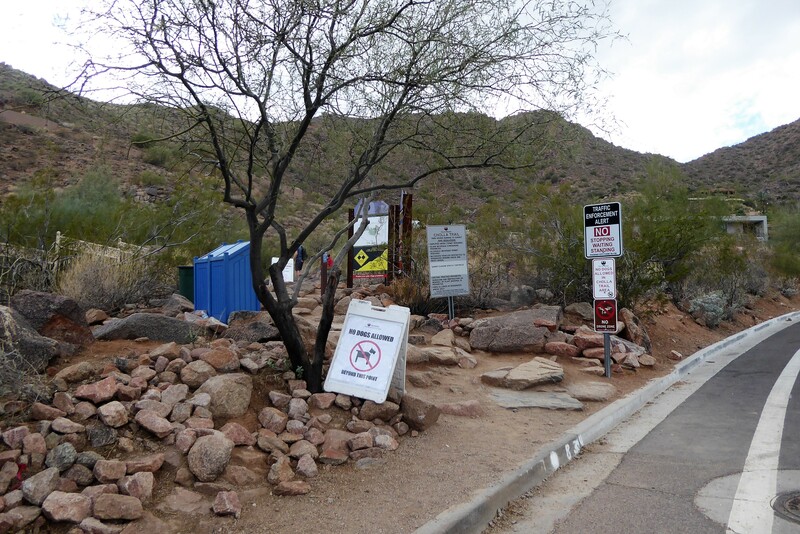 And the last warning about the trailhead — there are no bathrooms nearby. So plan ahead! 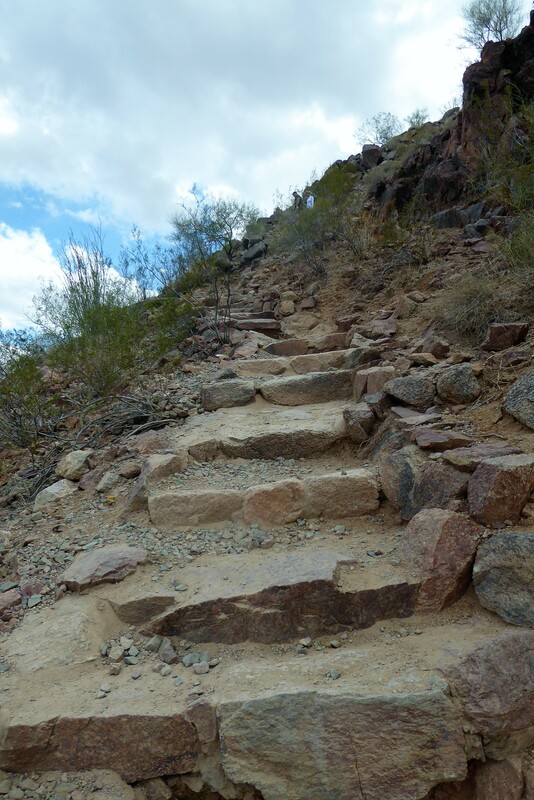 Cholla Trail begins with some switchbacks and man-made stairs that help you ascend quickly up the mountain. The path is wide, allowing hikers to freely pass each other. As you continue up, the path varies in width but remains a clear dirt path that is easy to follow. 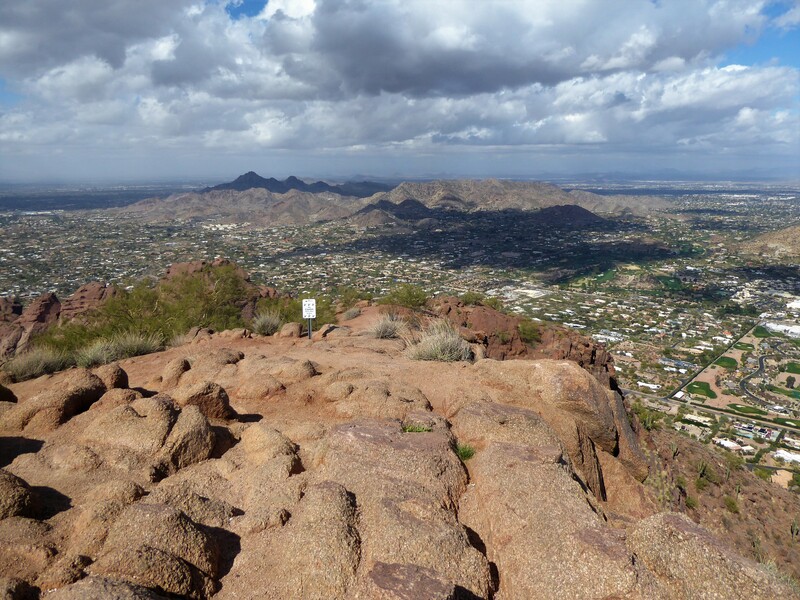 It will curve around the mountain giving you a birds eye view of the surrounding luxurious neighborhoods and at around a half mile the trail then begins to straighten out forming a beeline for the top of the summit. Along this direct route you will walk over the actual helipad. Up to this point, the trail has been moderate — a relatively flat path with a steady incline up. But now, once past the helipad the real fun begins! 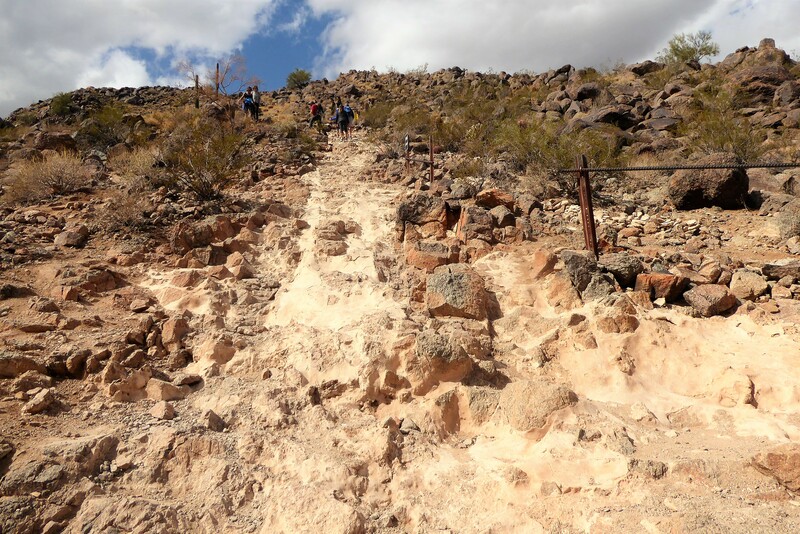 This trail transitions into a rocky and uneven surface that involves numerous sections that will require some scrambling. The first scramble obstacle appears immediately after passing the helipad. 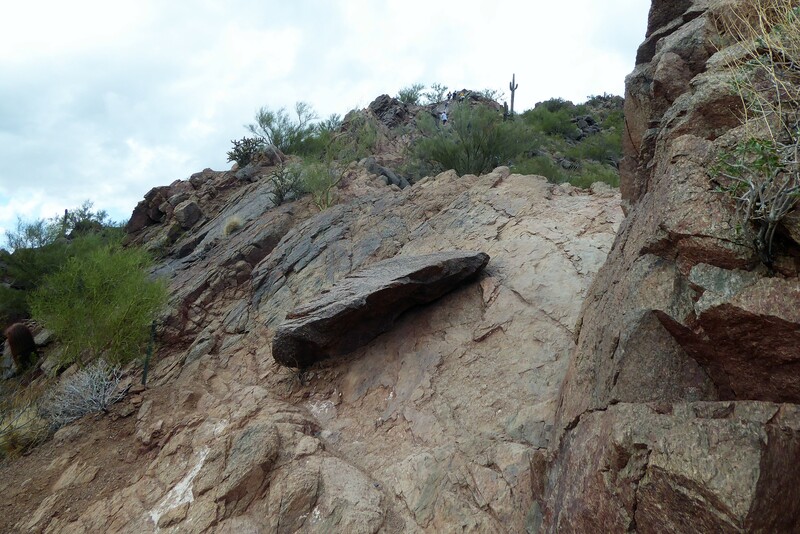 There is a slanted rock located right along the edge of trail that you need to climb up over. You will find small little notches along the right-hand side where you can place your fingertips in order to hold yourself up and climb up. Once up this section you will now be hiking directly along portions of the ridge-line of the mountain until you reach the top. 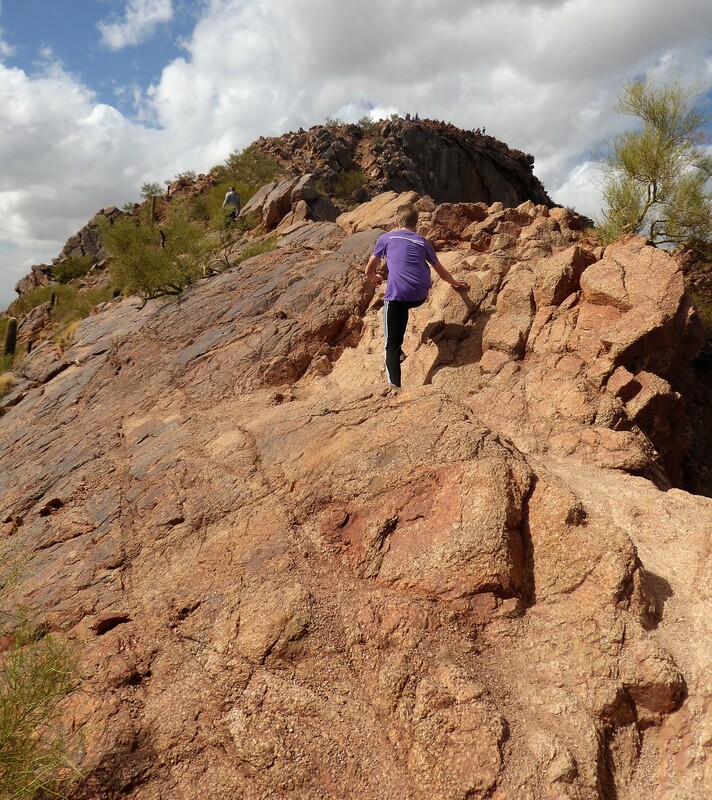 So, if you’re scared of heights, this trail may not be for you. Although the path is wide and there is not a lot of danger of falling, you will still be completely out in the open air with no side wall protections — so if you think your brain is going to fire up panic mode, just take a few moments to collect yourself and remember you can always slide your way back down to the established trail if you need to. As you continue forward, the path is marked by either trail signs or spray painted blue dots. 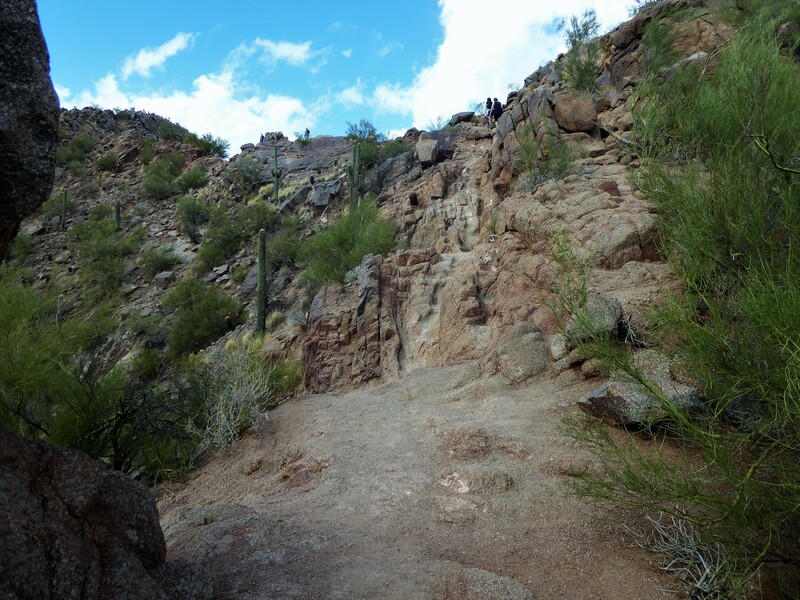 There are also some narrow areas in which the path will be a narrow scramble up allowing only a single hiker to hike at a given time. As you get closer you will be able to see the top of summit and other hikers celebrating their victory upon the top. From this point, the hard part of the hike is over and you follow the path up towards the top. Once at the summit find a spot to sit, relax and take in that view! You literally are on the top of Phoenix!